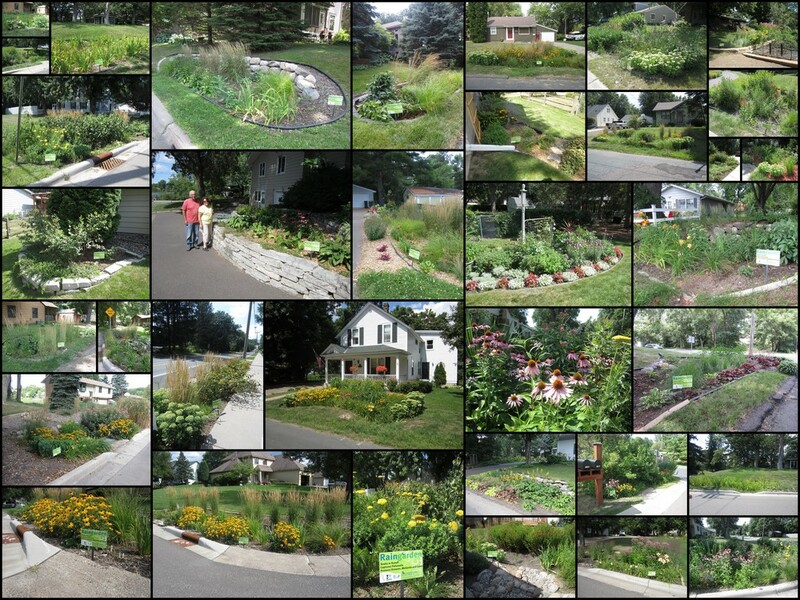 In 2013 we hosted two Raingarden Tours and Ice Cream Socials to celebrate the good work folks in Stillwater and Woodbury have done to protect our water resources. Raingardens are simply bowl-shaped gardens that collect and filter stormwater before it washes down the storm drains carrying harmful pollutants into our lakes and rivers. Here are links to the maps of those tours if you are interested. Take a tour of additional raingardens in Washington County. The following gardens are easy to find and publicly accessible. Edgewater Park Rain Garden (Woodbury) - Located near the intersection of Edgewater Drive and Lake Road in Woodbury, at the south end of Colby Lake. The rain garden is located within Edgewater Park, between the west end of the parking lot and the lake. Project was completed in 2005. Washington County Fairgrounds Rain Gardens (Baytown Township) - Located at the Washington County Fairgrounds, along the east side of Building D. Four demonstration rain gardens were installed in 2006 using different styles and plant materials. Interpretive signs located near the rain gardens explain the project. Carpenter Nature Center Rain Garden (Denmark Township) - Located in front of the main visitor center (12805 St. Croix Trail South, Hastings). This rain garden was installed in 2006 using partial cost-share assistance provided by WCD. Please call ahead at (651) 437-4359 to arrange for a staff person to give a guided tour. Washington County South Service Center Bioretention (Cottage Grove) - Bioretention cells (engineered rain gardens) are installed throughout the front parking lot at the new Washington County South Service Center. The site is located at 13000 Ravine Parkway South (off of County Road 19, about one mile north of Highway 61; across from the intersection of 90th Street South and CR 19). The project was completed in 2006. Gunnard Olson Rain Garden (Scandia) - This small rain garden was installed in 2005 to capture runoff from a small parking area and a mowed yard adjacent to Big Marine Lake. The site is located at 18804 Layton Avenue North. The rain garden is located between Layton Avenue North and Big Marine Lake.